on 1 chart. Now it’s easier to read the chart and see the big picture. and entry points. The most requested improvement to the ‘Better’ indicators. back to the original (single time frame) version of the ‘Better’ indicators. forex and stocks. And on all timeframes – tick, minute or daily charts. chart settings, trend algorithm, entry signals, profit targets, etc. QWhat differences are there between the original ‘Better’ indicators and the new versions? AThe major difference is that a new Multiple Time Frame view of the indicators is now available. Previously you had to watch 3 charts simultaneously to determine trend direction and entry signals. Now the trend direction and entry signals are automatically shown on a single chart. In addition, the code has been simplified and some of the more confusing elements (i.e. NoD, NoS, PT & St signals) removed. And if you still want the original (single time frame) indicators, just change 1 input and the indicators switch back to the original versions. QI already own the original ‘Better’ indicators, what should I do? AYou don’t have to do anything. The original indicators will be supported for the next 3 years, until 1 March 2019. That is, the indicators will be kept up-to-date with any trading platform changes. But if you want an easier way to determine the trend and entry points then you should subscribe to the new indicator set. QAre the original ‘Better’ indicators still available for purchase? ANo. It’s time to retire the original indicators – after all, they were released in February 2008. And after 8 years it’s time to let them go and move on to newer and better things. QWhat versions of TradeStation, NinjaTrader and MultiCharts do the indicators work with? QDo the indicators work on TradeStation Simulator and NinjaTrader Market Replay? AYes. The indicators work on TradeStation Simulator and NinjaTrader Market Replay. QDo the indicators work the same way in TradeStation, NinjaTrader and MultiCharts? AYes. The indicator values are calculated in a DLL and the exact same DLL is used in the TradeStation, NinjaTrader and MultiCharts indicators. Obviously the “look and feel” of the charts will be different and tick charts from different data feeds will never match exactly. But the indicators should be very similar between the different trading platforms. More information at the bottom of the page here on tick chart differences. QWill you release the indicators for ThinkOrSwim, MT4, Sierra Chart, etc.? AUnlikely. Supporting multiple trading platforms is hard work and I’m a trader, first and foremost. Plus, many of these other platforms simply don’t have the functionality needed. QDo the indicators work on Forex, Commodities, Bonds, Stocks and ETFs? Forex: Stick to the futures contracts traded on the CME Globex exchange rather than the cash markets. This way you get the volume data needed for the Better Momentum and Better Pro Am indicators. More information in the Forex video here. Commodities and Bonds: The indicators can be used for both day trading and swing trading. More information in the Commodities video here. Stocks and ETFs: Stick to swing trading or if you want to day trade then choose the most liquid/high volume Stocks and ETFs. Smaller volume Stocks (in particular) are heavily gamed by the Pros and the uptick/downtick volume data is more erratic. 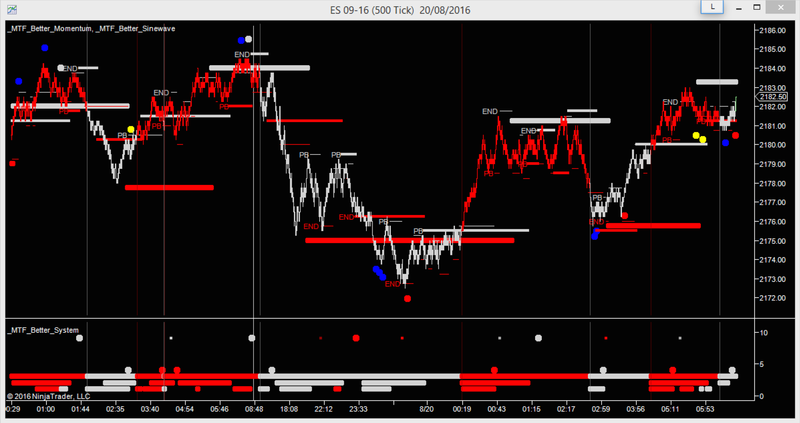 NQ, YM and TF: The indicators also work for trading NQ, YM and TF. Just adjust your tick chart settings to account for the lower transaction volumes. For day trading NQ use a 150 tick chart (or 1,350 if you’re swing trading). For day trading YM or TF use a 100 tick chart (or 900 if you’re swing trading). QDo the indicators work on minute, daily, candlestick, volume, range, momentum and renko charts? Minute charts: Better Pro Am (which calculates average trade size) is less accurate on minute charts than tick charts. On minute charts, the algorithm is a proxy and not actually measuring the average trade size. Better Sine Wave and Better Momentum work perfectly well on minute charts. Daily charts: The indicators work on daily charts. Although Better Pro Am is using a proxy to measure average trade size on daily charts, I think it works well. Candlestick charts: Better Pro Am and the new Multiple Time Frame system both use bar coloring that will interfere with candlestick charts. But the other indicators do work on candlestick charts. Volume charts: Better Pro Am does not work on volume charts. But volume charts are very similar to tick charts so I suggest using tick charts instead. Momentum charts: The indicators work on momentum charts. Momentum charts are very similar to range charts and the same comments apply. Renko charts: Better Momentum and Better Pro Am do not work on renko charts. This is because (on TradeStation at least) the volume cannot be split between buying and selling. But Better Sine Wave does work on renko charts. More information in the Volume, Range and Momentum Charts video here. QWhat data feeds do you recommend? AIt is important to use a high quality data feed, particularly with tick charts. And make sure your data feed has both real-time and historic data. TradeStation: The data feed is “in-built”. If you are day trading the Emini subscribe to the Globex Value Bundle for $20 pm. More information on TradeStation data feeds here. NinjaTrader & MultiCharts: There are multiple data feed provider options. Kinetick, eSignal, Zen-Fire and Vision Financial are recommended. Kinetick and eSignal cover equities, futures, forex and indices. Zen-Fire and Vision Financial only cover futures. Kinetick: Make sure you are using the real-time data feed, not just the free EOD data that is included as part of NinjaTrader. eSignal: You may need to adjust your tick charts because eSignal distributes “bundled” data from the CME. I recommend using a 200 tick chart instead of a 500 tick chart for Emini day trading – the bundling of data appears to add a factor of 2.5. DTN iQ Feed: I do NOT recommend as customers have reported issues when switching between charts and Better Momentum does not work on 60 minute charts. Interactive Brokers: I do NOT recommend as it is not a full tick-by-tick feed. More information at the bottom of the page here on the Interactive Brokers data. QCan I use the indicators on both my laptop and desktop? AYes. Multiple computers are no problem but you can only use one at a time. Just copy the installation file to your second computer and follow the installation process. QCan I change trading platforms? AYes. Just contact us and we’ll swap your subscription over. Alternatively, you can do it yourself by cancelling your subscription (using the ‘cancel’ link on your account page) and re-subscribing using one of the trading platform buttons above. QCan I get the indicators for multiple charting platforms? AYes. Just click on the ‘upgrade to multiple platforms’ link on your account page. The subscription for multiple charting platforms is $125 USD/month. The payment you have already made for the current month will be prorated and deducted from your first month of the multiple platforms subscription. QCan I edit or modify the indicator code? AOpen code is available for the TradeStation and MultiCharts versions of the indicators. Although the functions that calculate the signals are locked, the indicator and system code that calls the functions is open and can be customized. In this way you can write modified versions of the indicators or incorporate the signals into your own trading systems. QDo the indicators have input parameters that need to be changed or optimized? ANo. Personally I hate optimized code and none of the indicators have input parameters that need to be changed based on the market traded or market conditions. The indicator inputs only control things like colors, alerts, etc. QIs the price a one-time fee or recurring monthly charge for the indicators? AThe new indicators are available via a monthly subscription, billed automatically on a pre-paid, recurring basis. QWill my monthly subscription be renewed automatically? AYes. Your subscription will be renewed each month and the credit card you used at sign-up will be billed automatically, on the same date you first subscribed. You can update your credit card details at any time by using the ‘update billing details’ link on your account page. QWhat payment options do you accept? AWe accept Visa, MasterCard, Discover and American Express credit cards. Unfortunately we do not accept PayPal at this time. QHow long will it take to receive the indicators after payment is made? ALiterally seconds. Once payment is confirmed you are immediately sent to your account page where you can download the indicator installer file. QWhat is the installation procedure for the indicators? Input your trading platform customer number on your account page. Download the indicator installer file from your account page. Run the installer and input your Emini-Watch subscriber number (which can be found on your account page). Add the indicators to any chart. QCan I get help if I have a technical problem installing? AYes, absolutely. If you have any technical difficulties installing then just send an email and we will help you. Don’t forget to check the trading platform version you are using first. QDo the online video tutorials include setups and how to use the indicators to trade? 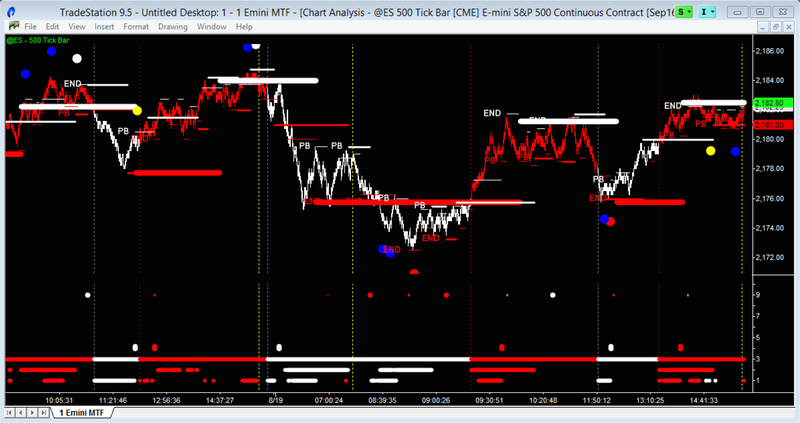 In addition, the Emini trading blog has video updates so you can see the indicators in action and how I use them to trade. Plus this is a useful page on a range of Emini trading topics. QHow often are the indicators updated and what does each update cost? AFrom time-to-time the indicator and system code is improved and updated. In addition, the indicators are kept up-to-date with new versions of the trading platforms. These updates are included in the monthly subscription. Customers are emailed as soon as a new version of the indicators is available. QWhat is your refund and return policy? AIn general, there are no refunds. We will only consider a refund in exceptional circumstances, for genuine reasons and at our discretion. QCan I trial before I subscribe? ANo. But the monthly subscription fee is very reasonable and will give you a month to evaluate the indicators and signals. QCan I cancel my subscription at any time? AYes. You can cancel your subscription at any time by using the ‘cancel’ link on your account page. Refunds are not given for any remaining pre-paid period. Barry I want you to know that I have seen every post you've done in the last 3 years. Your stuff is the greatest. I'm also very impressed with the caliber of people on your trading forum you can tell by the questions answered that the people are a very intelligent group and I feel part of an elite group. The way you developed 3 independent indicators I think is actually genius because it uses all the market information available. Thank you so much for all you do and I am looking forward to some good trading ahead. Keep the good posts coming. I have been using your _Better Indicators for 7 years now, with consistently improving success... so much so that I am on track to retire 5 years early and live off my trading income.. that is a BIG DEAL. Could not trade without them! I don't know how I could trade without them! You where ahead of your time when you first came out with these indicators strategies. I don't know how you were able to figure all this out. You were able to weed your way though all this Market Profile, EW, etc. It's all about the volume and getting on the correct side of the volume. You did a great job! Thank-you! I thought I must share my feelings and for your outstanding code for the indicators. I have deleted all my expensive indicators and removed from my computer. I have gain lot of confidence in my trading and I have started believing on myself, which I feel is very important. I dont over trade instead I take selective trade every day and I am a winner. The Better Indicators are simply amazing ... The Better Indicators do give me an AMAZING edge. Provided I can be patient and wait for extra-extra confirmation, I can get on board for some amazing trending moves. I have been a subscriber to the MTF indicator since the beginning and almost gave up on it. Then my epiphany came; trade in the direction of the trend on 1500 chart according to MTF indicator, don't touch the trade, 4 point stop loss and target profit and let it go. Of course there are targeted entry points but that is the general trading plan for me. I have just been killing it lately and I owe it to the new indicator. Thank you for giving me a new way of life. Thanks a million my friend. I'm up $1,000 over the past two weeks, and I'm excited, because I think I finally broke through the years of fog to begin to see clearly how to read the market, especially in real time. Better Inds absolutely sees with x-ray vision into the turns. I have amazed some Twitter friends who see the magic happening on-screen. The respect given to Better Sinewave levels is uncanny sometimes. These are the best tools I've ever used, and I trade with them everyday. Many kudos to you and your development team ... and the results have been amazing for me. I'm gaining a level of confidence using your MTF indicators I never had before. Can't imagine trading without them now, Outstanding! Thank you. You provide as much, if not more, content than anyone on your methodology. You've put together a beautiful set of indicators that should enable anyone to make money in the markets. The setup video was great. I'm trading 25 contracts, up from 3 when first subscribed two years ago to Better Indicators. Thanks! Today was a perfect tee-up at the Open. Took 4 points into End of Trend, 9:38 - 10:07 EST. Nice to be able to move on and enjoy the day. Thank you for giving us the freedom to live life. I simply can not trade without your excellent indicators. Thanks Again for your outstanding service that has significantly increased my profitability. Your indicators have taken me from a trader with a $10k account to launching a hedge fund next month. These are the real deal and I hope you stick around and continue to share your wealth of knowledge.